Since its service to the Newton County community began more than 60 years ago, Piedmont Newton Hospital has expanded its footprint to meet the needs of its growing population with additional growth expected. 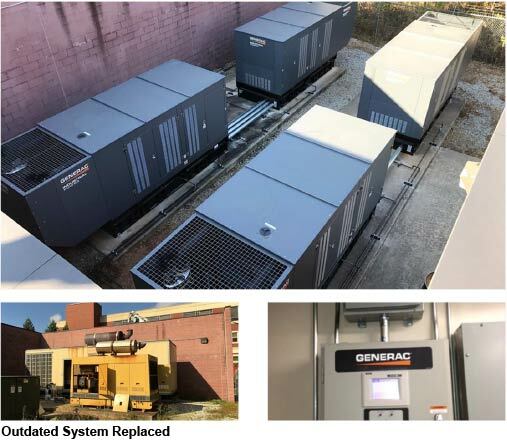 Between the ongoing growth of the 304,161ft², 97-bed hospital and its role as a foundation in the community, facility staff decided it was time to upgrade and increase its emergency power capability. With the current building load near 1MW, it was decided to go with a 4x600kW system with onboard paralleling and remote monitoring capability. The complete solution provides N+1 redundancy (N+2 on critical loads) and allows them to meet Joint Commission regulations for reporting and testing. The 2017 Atlantic hurricane season was catastrophic, with three major hurricanes making landfall on either the continental United States or U.S. territories. When severe storms like those hit, you like to think your business is prepared. The power goes out, but it’s only a matter of moments before the backup generator kicks in. Then after 30 seconds, there is still nothing. When you go to find out why, the answer becomes obvious. A generator cannot protect your property if it is submerged in floodwaters — an unfortunate consequence of many tropical storms. 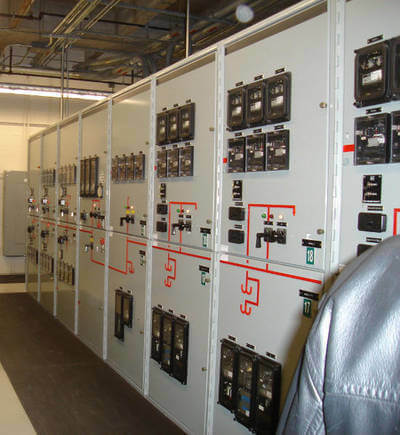 National Fire Protection Association (NFPA) 110 and 37 standards provide code-required guidelines for correct generator installation, and these address how to plan for potential flooding situations. NFPA 110 states that for natural conditions, Emergency Power Supply System (EPSS) design should consider the “100-year storm” flooding level or the flooding level predicted by the sea, lake, and overland surges from hurricanes. This means locating the generator in an area that mitigates flooding potential, such as on the roof or on a raised platform to situate it above the flood plain. While the NFPA 110 standard was put into place in 1985, the standards have not always been fully followed. On Aug. 29, 2005, Hurricane Katrina pummeled the city of New Orleans. Power outages triggered standby power systems. However, the levees protecting the city from the hurricane failed. 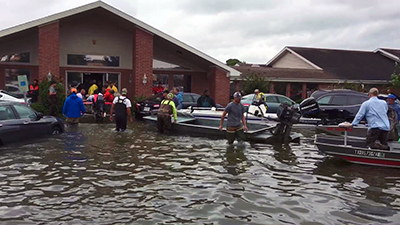 According to the Federal Emergency Management Agency (FEMA), this resulted in the flooding of 80% of the city. Many standby generating systems failed immediately as a result. Using available flood hazard information for the siting, design and construction of buildings. Designing and constructing structures to withstand anticipated flood loads. Using flood-damage-resistant materials below the design flood elevation. Mounting the unit no less than 2 ft. above ground or above the point identified as the prevailing highest weather level mark. 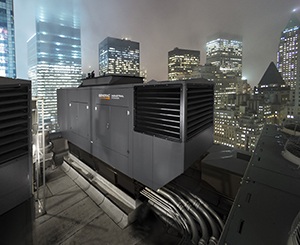 “Once the generator is flooded, the alternator windings may become compromised, and internal engine corrosion begins,” said Michael Kirchner, senior sales training manager for Generac Industrial Power. He said that in the case of flooding, most businesses will file for an insurance claim and have to go through the process of buying and installing a new unit, selling the generator at salvage value to third-party firms that will try to reclaim the equipment. 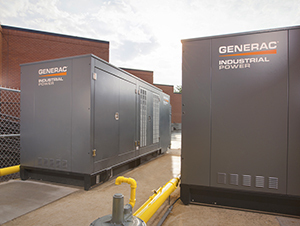 Severe weather doesn’t affect Generac Industrial Power systems. Kirchner said Generac generators are designed to start and run in any kind of weather. They are listed to the Underwriters Laboratories (UL) 2200 standard, a sign that the gen-set has been evaluated and approved by a nationally recognized testing laboratory. A generator manufacturer only receives approval to apply the listing after a rigorous review and identification of all the unit’s components. Part of the UL2200 examination is a rain test, which is performed to simulate a heavy rain using specific water nozzles, water pressure, flow rates and direction of spray onto the gen-set enclosure while it is operating at maximum airflow through the enclosure. After the water is sprayed onto the enclosure for one hour per side, the gen-set is shut down, and any amount of water accumulation inside the gen-set is evaluated for potential electrical hazards. The alternator is also hipot tested to ensure the electrical windings have not been damaged and to check for other electrical shorting by any ingress of moisture. Generac makes all of its own enclosures up through 2 MW, but not everyone does. Some manufacturers imply the complete generator system is UL 2200 approved when in fact they are utilizing a UL-listed open gen-set and then applying a third-party enclosure, skipping the important UL2200 rain test process. Generac makes factory enclosures for all of it products to ensure the highest degree of factory testing and genset reliability. Businesses should also consider fuel delivery when planning to install a backup power system. Generators require sufficient fuel supplies for extended running during storms. On-site diesel storage tanks are typically sized to provide 12 to 72 hours of run time. According to the NFPA 110, fuel tanks that are subject to temperature variations can experience accelerated fuel degradation, especially if the tanks are outside and above ground. The presence of water can lead to microbiological contamination and growth, which in turn can lead to general or pitting corrosion of steel tanks and components, possibly resulting in filter plugging, operational issues or a hydrocarbon release into the environment. NFPA 110 also requires fuel to be tested annually and remediated as necessary. Kirchner said that diesel generators must have a preventative fuel maintenance program to be deemed reliable. By comparison, natural gas generators avoid those fuel supply and maintenance issues. The natural gas pipeline network is robust. According to a 2013 report by Massachusetts Institute of Technology’s Lincoln Laboratory, natural gas distribution systems operate at a reliability rate exceeding 99.999%, with the exception of seismically active areas. Incidentally, that makes the natural gas distribution system approximately one-thousand times more reliable than a single-engine generator set, which is typically assumed to be 99% reliable. In any case, Kirchner advises to always run the generator before a storm hits and transfer the facility load onto it to validate that it is working properly. By running necessary exercises and tests on the generator, as well as following all of the laws and regulations, your Generac generator will be ready to tackle any storm and ensure you are too. NFPA 110: Standard for Emergency and Standby Power Systems covers requirements for emergency and standby power systems whose reliable operation is necessary, in varying degrees, to ensure the safety of human beings. Updates to NFPA 110 occur on a 3-year cycle, like many of the NFPA codes. A number of changes were made in the 2016 edition. In general, these changes were incremental: new requirements were added, old requirements were modified, and some were clarified. 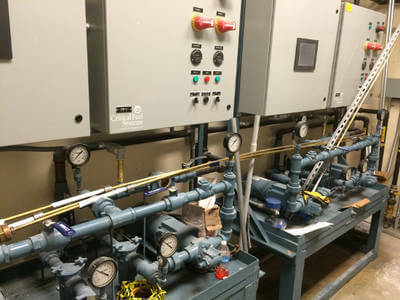 Of particular interest are changes to Chapter 8: Routine Maintenance and Operational Testing, as those changes affect all installations covered by NFPA 110. A section on record keeping was added in 2016. Emergency power supply (EPS): The source of electric power. In practice, the EPS is typically the generation system. In paralleled systems, the EPS includes the generators and the paralleling gear (see Section 3.3.3). Emergency power supply system (EPSS): The EPS, together with its distribution, conductors, controls and monitoring devices, and transfer switches. The EPSS extends from the generators to the load contacts of the transfer switches (Section 3.3.4). Level 1 systems are those whose failure could result in death or serious injury (Section 4.4.1). Examples of loads served by Level 1 systems are egress lighting, fire alarm systems, and fire pumps. Level 2 systems are those whose failure is less critical to human life or safety (Section 4.4.2). Annex A: Explanatory Material adds that Level 2 systems typically serve loads whose loss could create hazards or hamper rescue efforts. Examples of loads served by Level 2 systems are heating and cooling systems, sewage-disposal equipment, and certain industrial processes. Section 1.1.3(6) states that NFPA 110 covers only Level 1 and Level 2 systems, whose operation is necessary to protect human beings. Requirements sometimes vary depending on the hazard should the equipment fail to provide power when necessary. No further levels are defined, as NFPA 110 does not cover systems that are less critical than Level 2. The changes between the 2016 edition and the previous editions of NFPA 110 can be described as incremental. Changes affecting the design of standby power systems, which will affect only new systems installed under the 2016 edition, include new requirements for fuel systems. The most extensive changes to the code are additions to Chapter 8, describing routine testing and maintenance requirements, and will affect both new and existing systems. These additions include a new section on generation and retention of testing and maintenance records. A new requirement describes installation acceptance testing requirements for paralleling gear. Some of these changes are implemented in the code itself and are directly enforceable. Other changes are clarifications included in the explanatory material, which provide information regarding the intent of the code. New to the 2016 edition is Section 7.9.13, which prohibits automatically actuated valves in the fuel supply or return lines. The intent is to avoid inadvertent interruption of the fuel supply by unintended or improper operation of a valve or its controls. Automatic control of fuel valves adds a layer of complexity to the fuel system and creates a single point of failure for the EPS. There is no corresponding prohibition of manually operated valves. These valves are typically used to isolate portions of the fuel, allowing for continued operation of the system when one of its components requires maintenance. Section 7.9.11, unchanged from the previous edition, requires that manual valves provide a visual indication of their status. There is no direct requirement that manual valves be supervised to ensure that they are left in the open position after maintenance activities. Section 5.5.1 prohibits using the fuel supply of a Level 1 system for any other purpose. In both editions, this prohibition is amended in paragraph 5.5.1.1, which permits the fuel supply to serve other systems, provided that other systems can’t draw down the fuel level to a point that would compromise the continued operation of the EPSS. In the 2016 edition, additional language permits passive features designed to ensure that an appropriate level of fuel is available for the EPSS. The 2013 requirement can be read to require that the fuel-use rate of other systems must be so low that it can’t materially affect the amount of fuel available to the EPSS. The additional language in the 2016 edition permits other measures to limit the fuel drawdown. An example of such a passive measure might be the installation of the second fuel intake at a high level in the tank, so that other systems would lose their fuel supply before the continued operation of the EPSS was compromised. Section 5.5.1.1 specifically permits passive features to prevent other systems from endangering the fuel supply to the standby power system. It doesn’t mention active features, such as automatically operated valves, for that purpose. Presumably, an automatically operated valve serving a second system wouldn’t meet the intent of the code because such a valve may fail in the open position as easily as it might fail closed, jeopardizing the fuel supply to the standby power system. Section 6.2.3 requires a method of preventing inadvertent interconnection between any two separate power sources, either by mechanical interlocks or by some other means approved by the authority having jurisdiction (AHJ). The intent of this requirement is to protect the EPSS from damage due to connection to an unsynchronized power system. Historically, some AHJs have interpreted this requirement as a general prohibition against any interconnection between sources, whether inadvertent or intentional. While Section 6.2.3 remains unchanged in the 2016 edition, a new entry in Annex A: Explanatory Material clarifies that intentional interconnections are not strictly prohibited by the code and may be applied with the approval of the AHJ. The most common type of transfer switch, an “open-transition” switch, briefly disconnects the load from both sources when it operates, even when switching between two live sources. A transfer from the alternate source to the normal source, as typically happens after the normal source is restored to service, results in a very short outage on the order of roughly 1/10 second. This disturbance on the electrical system can be ameliorated with a “closed-transition” switch, which briefly connects the two sources before releasing its contact with the alternate source, typically for less than 1/10 second. Switch controls monitor the phase angle of each system and initiate the transition when the two sources are quite close to synchronization-when the phase angle between them is nearly zero and changing slowly. A “soft-loading” system connects the two sources in parallel and controls the power output of the local source to smoothly transition the load from one source to another. When the load has been fully transferred to the destination source, the other source is disconnected. A soft-loading system can provide a very smooth transition between live sources, at the cost of increased complexity. A soft-loading system is a bona fide paralleling system, with all its attendant operational requirements. Such a system is normally applied where parallel operation with the utility is required for some other purpose, such as peak shaving, demand response, or to facilitate load testing of large systems. Generally, closed-transition switches and soft-loading systems must be approved by the electric utility as well as by the AHJ. Some utilities will require complex protection systems before for even the briefest interconnection, while others will be more permissive. Designers should work with both AHJs and utilities to determine requirements for closed-transition switches or soft-loading systems before applying them. For systems consisting of paralleled EPSs, Section 7.13.4.1.3 requires that the control functions for paralleling generators and for load shedding must be verified against the system design documentation. This requirement is new to the 2016 edition. The previous addition did not address load shedding, and for paralleled systems, required only that load testing be performed with the quantity of EPSs intended to operate simultaneously. At first look, this addition brings a layer of complexity to initial acceptance testing. Paralleling and load-shedding strategies can be complicated, with multiple contingencies. A thorough test of those functions will involve selectively disabling individual EPSs to simulate unit failure, and varying system loads to trigger load-shedding functions. Thorough testing of all functions, under all possible failure conditions and a reasonable number of load conditions, could become onerous for large systems. In practice, though, this new requirement will have limited effect. Typical industry practice calls for extensive start-up testing of parallel systems, and most systems are commissioned by an independent authority. To a degree, this requirement codifies existing industry practice. A number of changes were made to Chapter 8: Routine Maintenance and Operational Testing. These changes will impact all systems covered by NFPA 110. Section 1.3: Application states that the testing and maintenance requirements of Chapter 8 apply to existing systems as well as new systems, while the remainder of the code applies only to new systems. Owners of systems that require regular certifications, such as hospital systems, can expect to see their system testing and maintenance records inspected by their accrediting agencies, once those agencies adopt the 2016 edition. The 2016 edition adds a requirement for paralleling gear in Section 8.3.5(5), which requires verification that “system controls will operate as intended.” No such requirement was included in previous editions. This requirement is the companion to Section 7.13.4.1.3, described above, which requires verification of system controls, including paralleling and load shedding, during initial acceptance testing. An exhaustive test of system control functions would require a considerable effort and would be disruptive to the operation of an existing facility. The operational testing requirements of Chapter 8 generally are designed to minimize the operational impact on an existing facility. This new requirement offers no specifics. In practice, it may be as simple as observing that the system is capable of bringing all units online in parallel, with selective load shedding demonstrated by taking a unit out of service while serving a simulated load. It remains to be seen how AHJs will interpret this requirement, and how it will be enforced. Sections 8.3 and 8.4 call for monthly testing of the EPSS, including the transfer of each automatic and manual transfer switch to the emergency position for at least 30 minutes at operating temperature. Section 8.3.2.1 requires that the test be initiated at an automatic transfer switch, meaning that the normal power to a switch must be de-energized, or that the call for power from the alternate source be initiated from a switch by some other means. The purpose of requiring initiation by a switch is to verify that the switch is able to signal the generating system that it has a requirement for standby power. In the 2016 edition, a new requirement in 8.4.3.1 calls for “rotating” the transfer switches to verify that each automatic transfer switch (ATS) is able to start the system. A corresponding new entry in Annex A: Explanatory Material restates the intent and clarifies this requirement, recommending that each successive test is initiated by a different switch. The Annex entry also states that “consideration should be given the ATS criticality,” suggesting that it is not necessary that each switch be operated in turn, but that critical switches-those that can affect the safety of human beings-might initiate tests more frequently than less critical switches. Transfer switches are required to be exercised monthly. Section 8.4.6.1 requires that each automatic transfer switch must be electrically operated to transfer from its normal position to the alternate position, and back to the normal position. A new entry in Annex A: Explanatory Material clarifies-and, to a degree, relaxes-this requirement, allowing operation of selected transfer switches to be performed at times other than the monthly test of the EPSS. Annex A 8.4.6.1 states that selected ATSs may be transferred back to their normal position before the end of the 30-minute test of the EPSS. It also allows for selected switches to be operated at a different time from the EPSS test, when safety considerations or operational considerations require it. The term “selected” suggests that a limited number of switches may fall under this rule, and that there must be some compelling reason to test them for shorter durations, or at different times, than the EPSS test. Section 8.5 was added to the 2016 edition to clarify and consolidate record-keeping requirements. Sections 8.5.1 and 8.5.2 require that records be created and maintained for inspections, tests, maintenance, and modifications of components of the EPSS-and that those records be available to the AHJ on request. Section 8.5.3 describes information that must be recorded including date, identification of personnel performing the work, unsatisfactory conditions found and actions taken to rectify them, and testing of repairs. Finally, Section 8.5.4 requires that the retention period for these records be established. A number of changes to the 2016 edition fall into the general category of clarifications. These changes have minimal impact on the design, operation, or maintenance of standby power systems and generally serve to bring the code into harmony with current technology and practice. The 2013 edition calls for a “voltage-adjusting rheostat to allow ±5% voltage adjustment” on the generator control panel, in 5.6.9.9(4). The 2016 edition replaces the specific requirement for a rheostat with a more general requirement for a nonspecific “feature” to implement voltage adjustment. 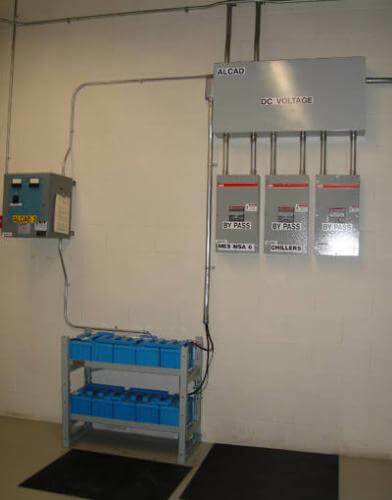 Definitions for valve-regulated lead-acid batteries (VRLA) and vented, or flooded, batteries appear in Section 3.3: Definitions. In the 2013 edition, a description of each type of battery was included in its definition. In 2016, these descriptions were moved to Annex A: Explanatory Material. It’s unlikely that this change will have any effect on enforcement. Both editions require that “all equipment shall be permanently installed” (Section 4.4.3). NFPA 110 is applicable to installations that have some level of impact on the safety of human beings. It’s therefore expected that no component of even the slowest system will have to be physically relocated to provide service when the primary power source fails. A new paragraph has been added to Annex A: Explanatory Material, clarifying that this requirement is not intended to prohibit the use of portable temporary equipment when the permanent installation is out of service. The 2016 edition changes this wording to, “maintaining a charge on both the starting and control battery unit.” The revised wording clarifies that the requirement strictly applies to both starting and control batteries. The first three items in this list are the durations of events that occur only at the beginning of the 90-minute test. Any recordings entered for these items will either be a copy of the initial measurement or some verbiage like, “not applicable.” The remaining items are system conditions that are continuously observable. These requirements have been revised in the 2016 version to separate items that occur once from those that persist throughout the test. Section 7.13.4.3.4 now calls for recording all the single-occurrence items listed above at when the system first accepts load. Section 7.13.4.3.5 requires recording of the continuous quantities at first-load acceptance and at 15-minute intervals thereafter. This change is generally an acknowledgment of the realities of the actual course of the prescribed acceptance test. It will have a negligible effect on enforcement. Section 7.9.1.1 describes requirements for installing and maintaining the fuel system, referencing several applicable NFPA codes concerned with flammable gases and liquids used as fuel. The code is unchanged from the 2013 edition, but a new entry in Annex A: Explanatory Material recommends that cleaning and purging of fuel gas piping be performed in accordance with NFPA 56: Standard for Fire and Explosion Prevention During Cleaning and Purging of Flammable Gas Piping Systems. Changes and additions to the 2016 edition of NFPA 110 are incremental, with regard to the code as a whole. The design of new systems will be primarily affected by the prohibition of automatically operated valves in the fuel lines of the standby power system. The clarification of requirements for transfer switch interlocks may make new options available for continuity of power in jurisdictions where the previous requirement was interpreted to prohibit any interconnection, inadvertent or otherwise. Verification of parallel-system operation, long the industry norm, may have an impact on the acceptance testing portion of system specifications. Going forward, new testing, maintenance, and record-keeping requirements will affect all systems.